The dress I present today has been finished nearly nine months ago. But the time we make the photos, we were already in the spring. Showing gray flannel in April has a depressing side, so I waited for the cold to be back to write this post. And reshoot some pictures. This is an armor dress that can stand the cold weather from the East and the raging wind from the West. When wearing this dress inside, I can lower the heating of at least 5 degrees Celsius and save some penguins. 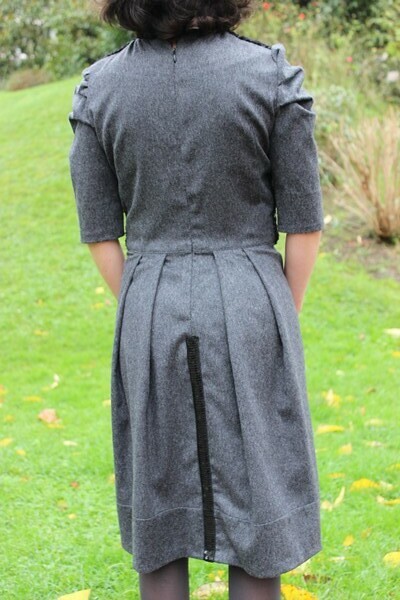 A dress made in wool flannel with an extra layer in wool for the front bodice. The wool flannel is a fluffy fabric that is very easy to sew but difficult to iron. It does not mark but the result is never very neat. Any error shows up. On the back, for example, a few millimeters higher on one side compared to the other are clearly visible in the photos. The pleats on the sleeves are intentional. I gave a princess look to this dress by creating volumes on the sleeves and skirt. 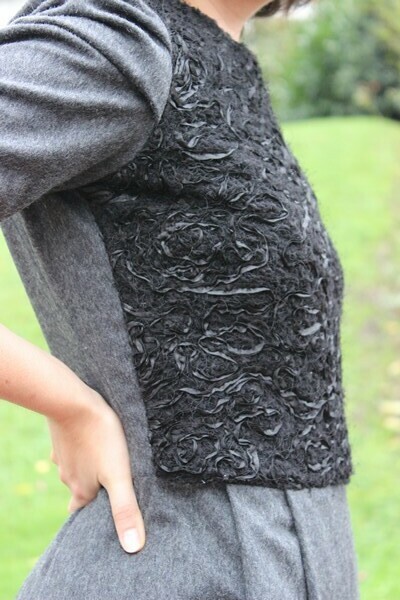 I have hidden two pockets in the front pleats of the skirt and I added a strip of sequins at the front and back hem. After 9 months, I wonder if it was a good idea but I worked so hard at this armor that I want to leave it as it is. Wintery and sparkling. This entry was posted in Projects and tagged dress.